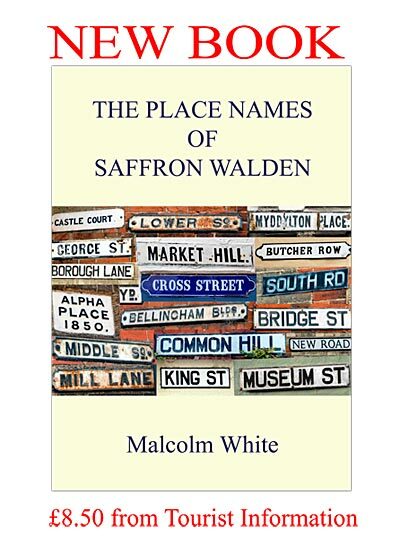 Three members of the Recorders of Uttlesford History have helped a local author to produce a new book, The Place Names of Saffron Walden, now on sale at the Tourist Information Office in Saffron Walden. Clavering Recorder Jacqueline Cooper edited the book, Littlebury Recorder Lizzie Sanders designed the cover and Saffron Walden Recorder Gordon Ridgewell dealt with images. The author, Malcolm White is well known as former Town Clerk and is now retired and pursuing his interest in local history. If unable to get into town the book can be purchased from malcolmdwhite@tiscali.co.uk The book costs £8.50 + £2 pp and is published by SWHS Publications, a non-profitmaking extension of the Saffron Walden Historical Journal. All profits are ploughed back into the publication of further historical research on the town and surrounding district.